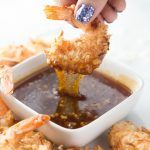 This Healthy Coconut Shrimp Recipe can easily be made in the Air Fryer or in the Oven and it’s DELISH with some homemade Sweet Chili Sauce. It’s easily gluten free and perfect for the 21 Day Fix and Weight Watchers! Place all the sauce ingredients into a small saucepan and cook over medium heat until the sauce begins to bubble and just begins to thicken (about 2-3 minutes). Remove from heat and cool – it will continue to thicken. I like to serve it cold from the fridge! Preheat air fryer to 375°F. Combine coconut flakes, panko crumbs, sugar and salt in a bowl. Place the flour in a small bowl. Whisk egg in another bowl. Dip the shrimp in the flour, shaking off excess, then into the egg, then in the coconut crumb mixture. Spray the air fryer basket with cooking spray and spray the shrimp, as well. Cook the shrimp, in batches, 4 minutes on one side, turn cook 2 minutes (6 min total). Repeat with the remaining shrimp. Serve with dipping sauce. Preheat oven to 425°F. Spray a baking sheet with parchment paper. Lay shrimp on the cookie sheet then spray the top of the shrimp with cooking spray; bake in the middle rack for about 10 minutes. Turn shrimp over then cook another 6-7 minutes or until cooked though. Remove from oven and serve with dipping sauce.